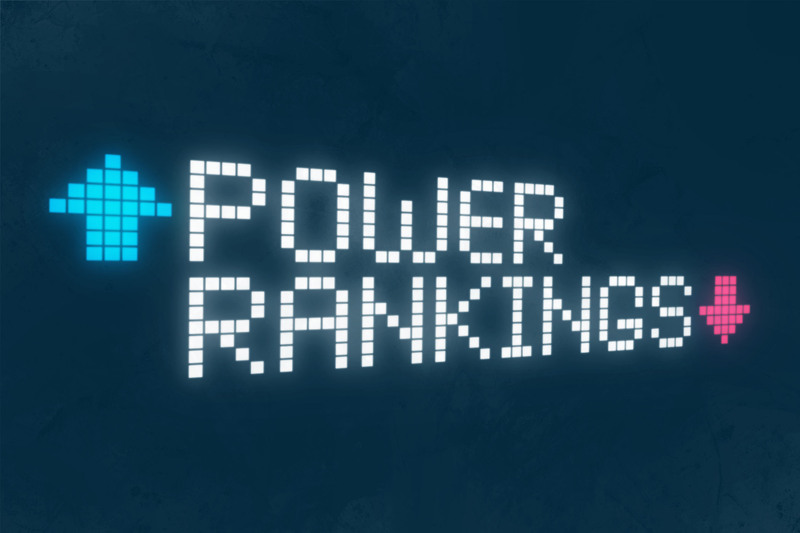 Power Rankings: Week 16 - The Point Data-driven hockey storytelling that gets right to the point. 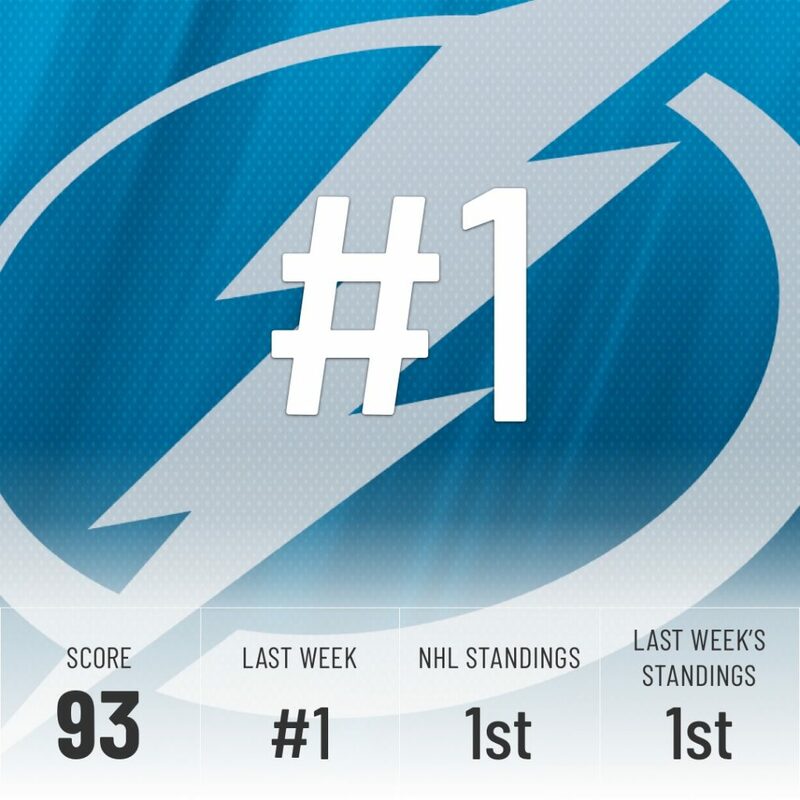 Tampa only played one game since our last Power Rankings, but they recorded a convincing victory over the Sharks. That’s more than enough to keep first place in the standings once again. The Flames got three wins against teams in the bottom half of the NHL standings and are now closer to the first place Lightning than they are to the third place Sharks. 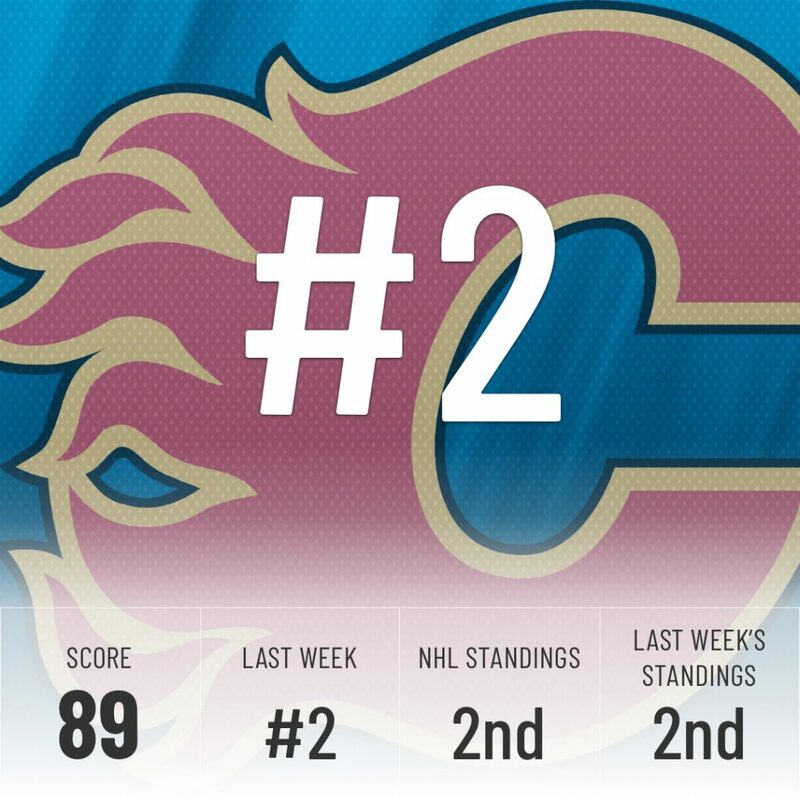 If Tampa slips up in any way, the Flames are ready to pounce on first place. Something to keep an eye on after the All-Star break. 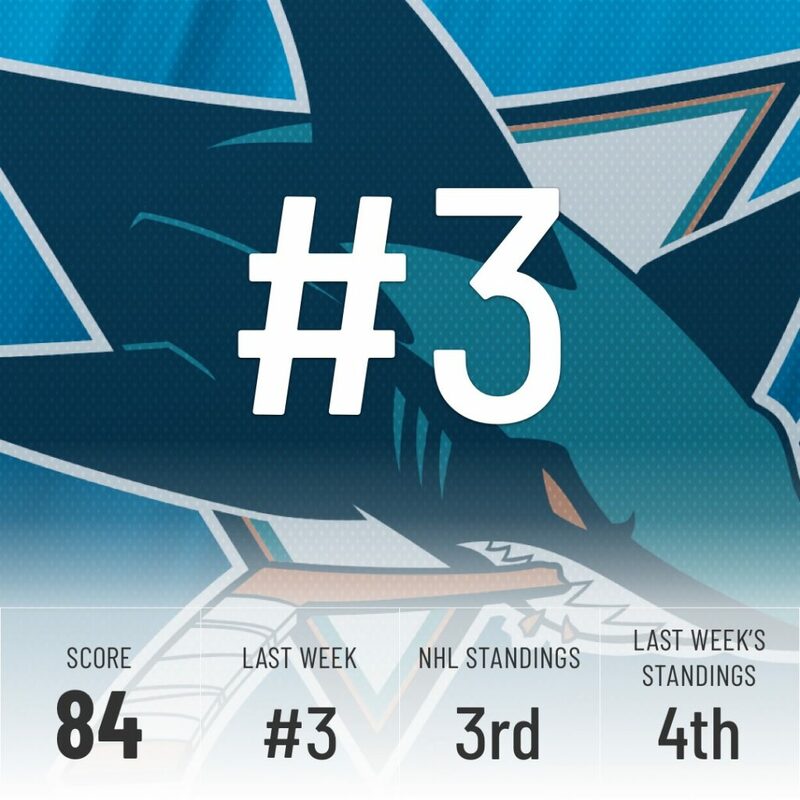 The Sharks enter the All-Star break off a very concerning four-game stretch in which they gave up six goals in all four games. The Super Computer isn’t too concerned and believes it’s just an outlier, so they keep 3rd place. For now. 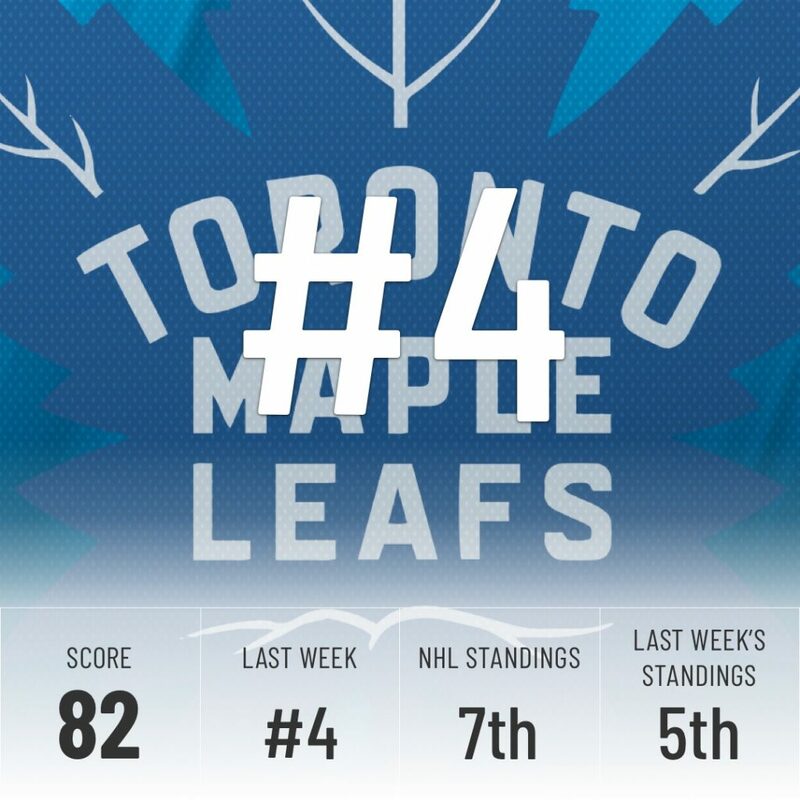 The Maple Leafs have yet to string together two straight wins in 2019. Their goalies are having a tough time fighting through screens as we detailed earlier this week. The good news is Auston Matthews finally scored, snapping a seven-game goalless streak. Hopefully for them, he can regain his touch after the All-Star break and return to his elite goal-scoring ways. Unfortunately, the Jets lost their only game of the week, snapping what could’ve been a five-game win streak entering the break. 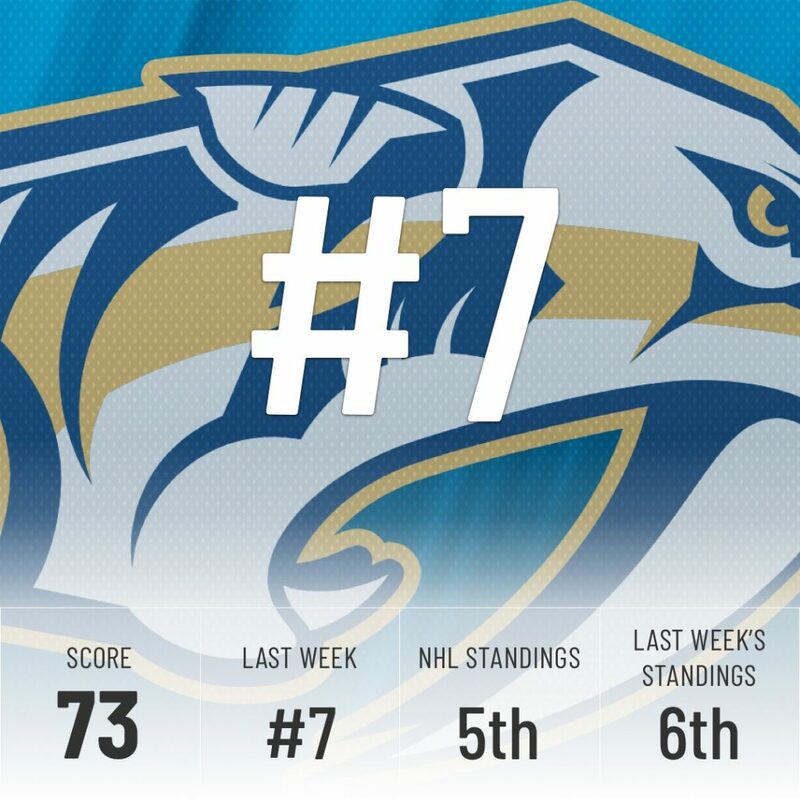 Still, they are currently tied in points with the Predators for the division lead with four games in hand, a very comfortable spot to be in for the final stretch. Vegas pummeled the Penguins 7-3 to start off their week on the right foot, but that was all the winning they would do before the All-Star game. Still, they enter the break 10 points ahead of the first Wildcard spot. Hopefully they will clinch a playoff spot early to give Marc-André Fleury some rest. Flower has started 45 of the team’s 52 games so far. The Preds were blown out twice last week, but it seems it was just a blip on the radar. They’ve now allowed no more than one goal in three of their last four games, all against very dangerous offensive teams (Winnipeg, Vegas, and Colorado). That’s more like it. 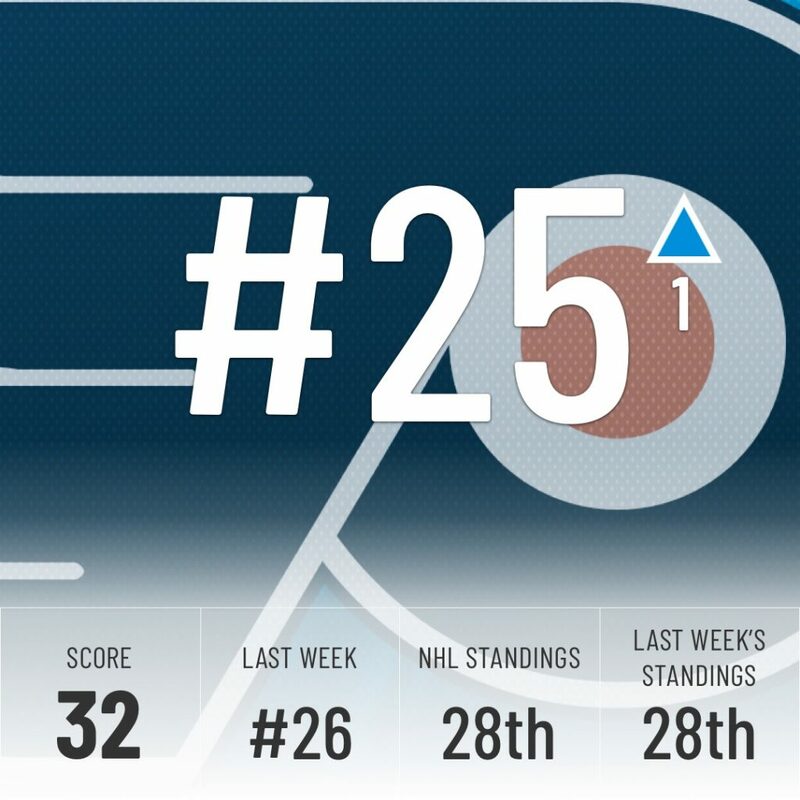 The Penguins are currently outside of the Metro’s top three, but with a +23 goal differential, second best in the division, they look poised to climb back up and the Super Computer agrees, ranking them as the top team in the division and five spots higher than their place in the NHL standings. 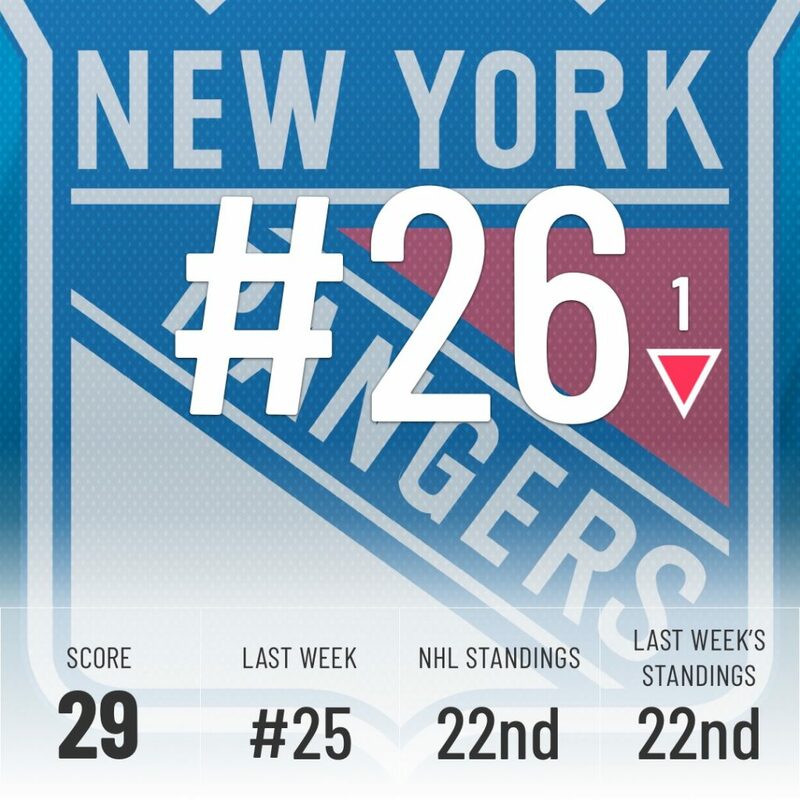 Boston missed its chance to claim third place in the Atlantic, losing to the New York Rangers in their only game of the week. 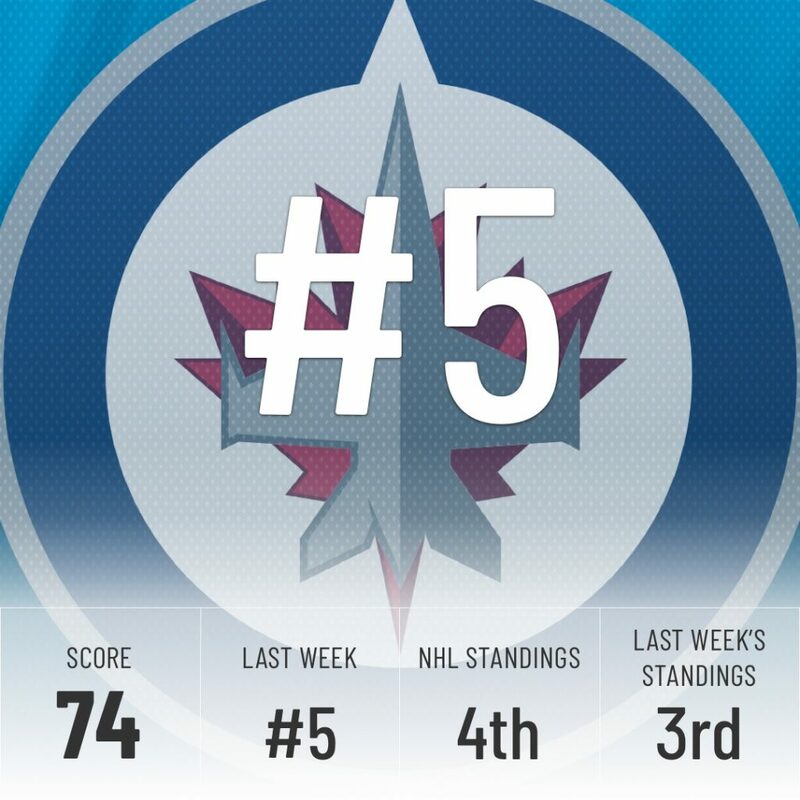 Still, they’re just two points behind the Canadiens with two games in hand. Just like Pittsburgh, they’re a team the Super Computer believes will shoot up the standings after the break. Keep an eye on them. The Islanders were one shootout win against the Blackhawks away from entering the break on a scorching eight-game win streak. They’re proving everyone, including us, that we underestimated them entering the season. They went from last in goals against last season to first this year, a massive turnaround we analyzed here. The Super Computer agrees, these Islanders are for real. 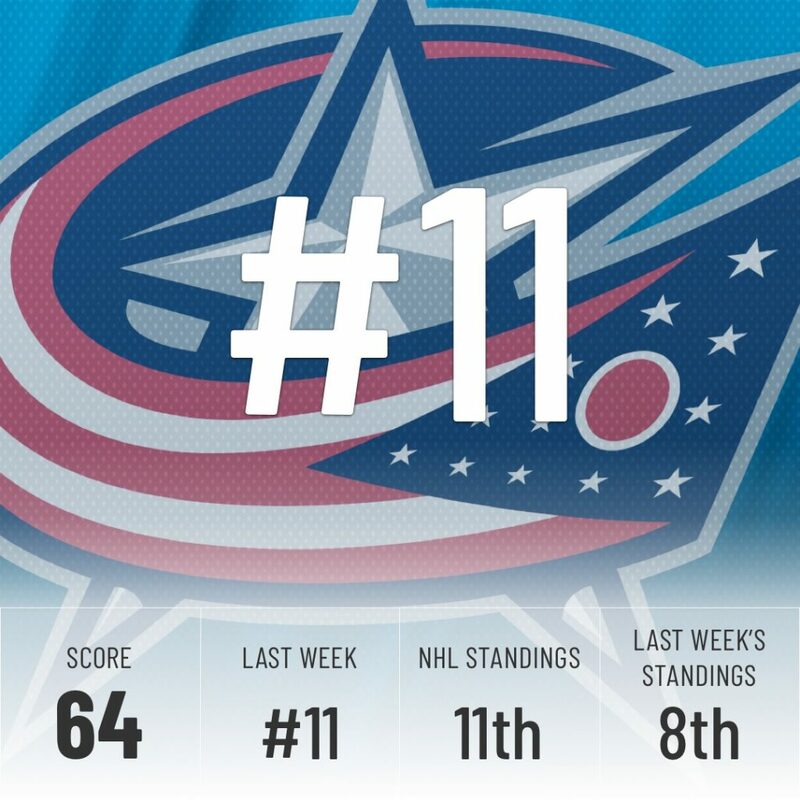 The Blue Jackets fell down three spots in the NHL standings, down to 11th, right in line with what the Super Computer projected a week ago. 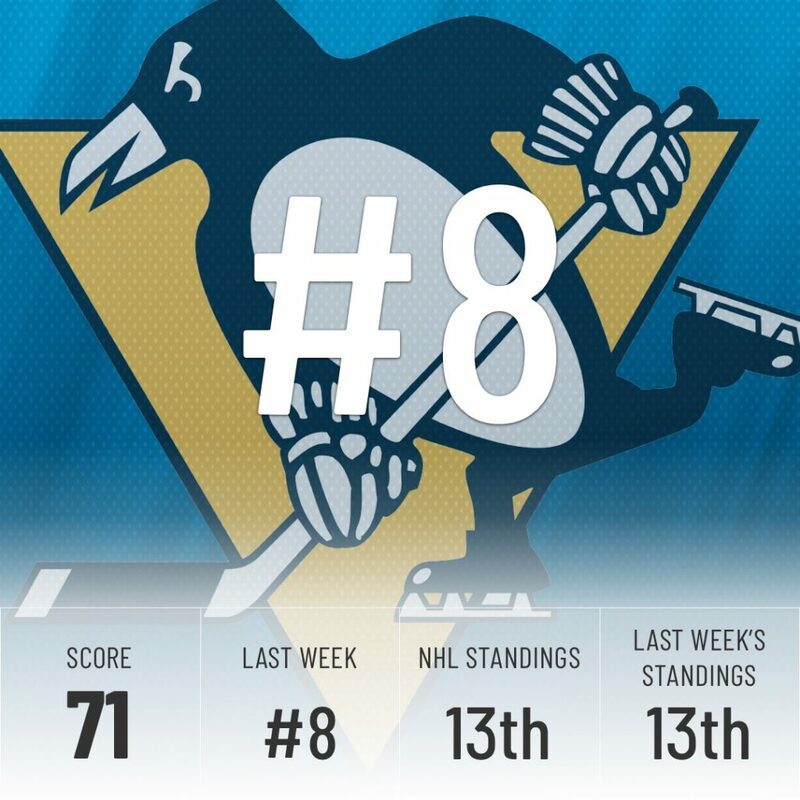 Keeping the Penguins behind them will be a tough task, but they just as well could make a run for the division lead. Only five points separate the top four teams in the Metro. 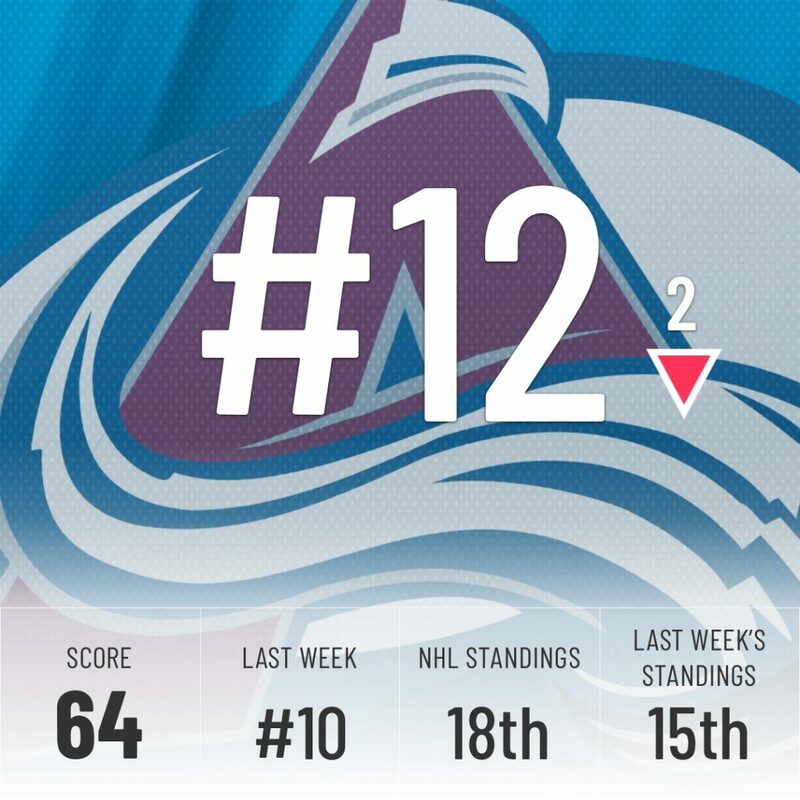 The Avs continue to struggle and they continue to fall down the standings. Their only win of the week came against the basement-dwelling Kings and it was followed up by a pair of losses in which they combined for only three goals. The Avs now have a meager three wins in 2019. Hopefully for them, the All-Star break will help them turn things around. If not, they can kiss the playoffs goodbye. 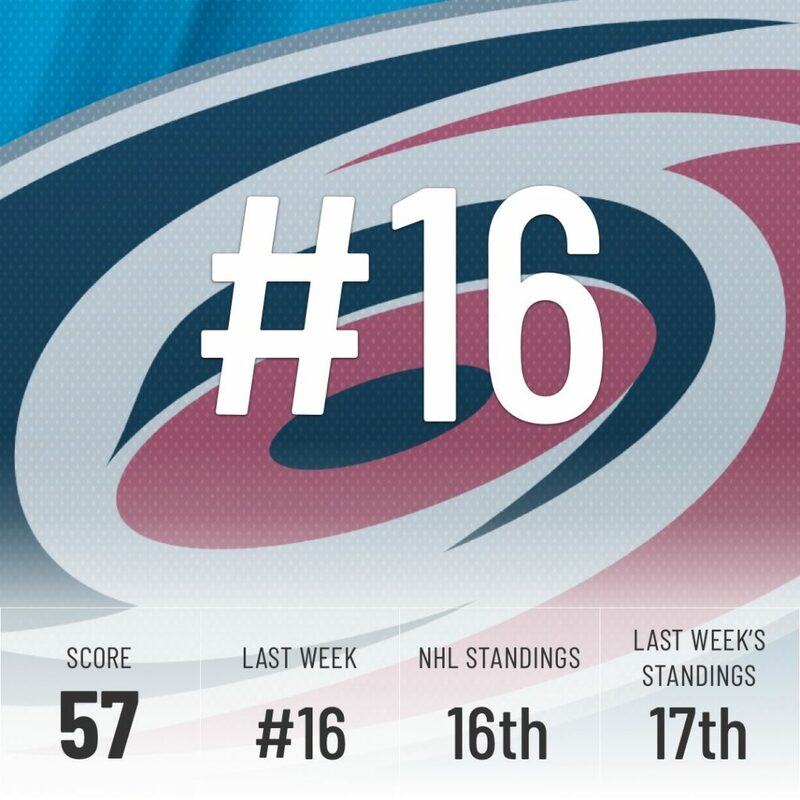 Colorado is in the last wildcard spot and there are five teams behind them within three points. Minnesota enters the break fresh off a three-game win streak. With the way their schedule is looking going forward, they could very well keep their streak going and solidify their 3rd place in the Central. They only face three teams currently in a playoff spot in the whole month of February. If there ever was a time to make a run, it’s now. 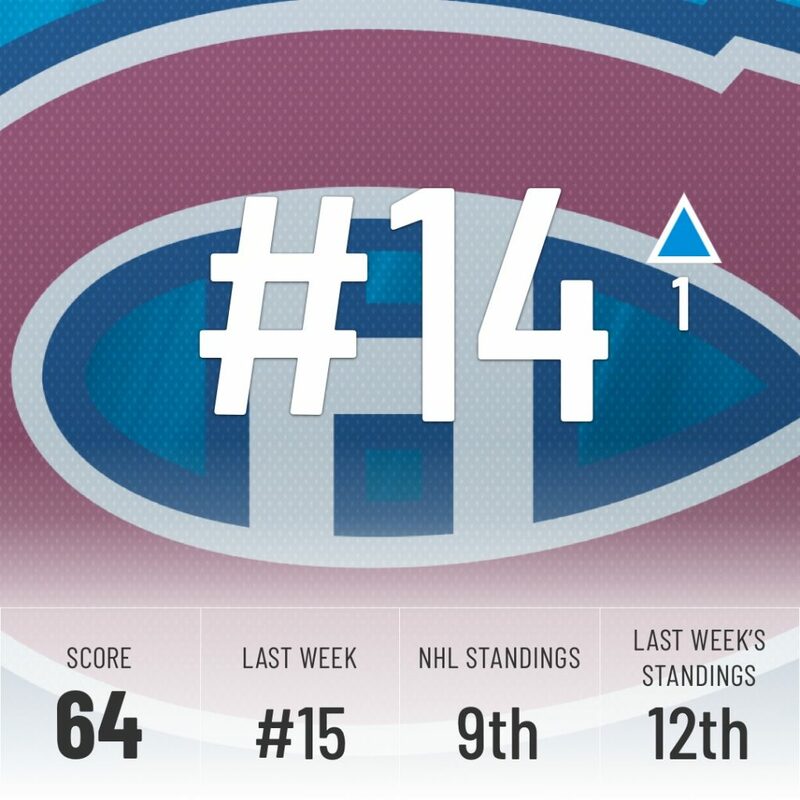 With two wins in three games this week, the Canadiens have cracked the top 10 in the NHL standings, but the Super Computer isn’t as high on them, ranking them much closer to the middle of the pack. They have the lowest goal differential and played the most games of any Eastern playoff team. They’re in the heart of the playoff race, but they look more like a Wild Card team than a top 3 finisher in the Atlantic. 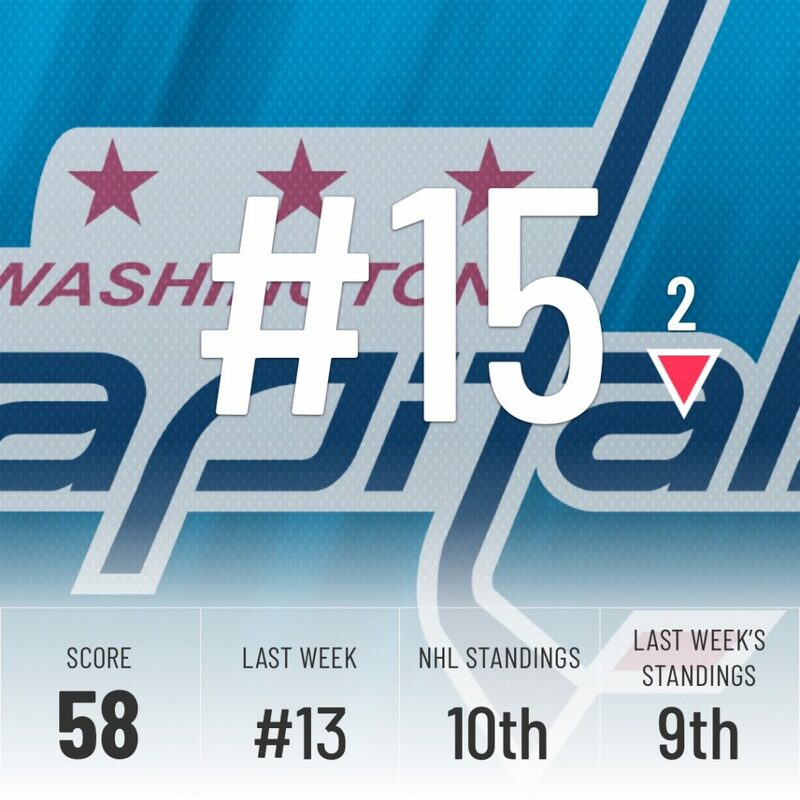 It’s been a terrible stretch for the Capitals. They’ve lost their last seven games and gave up six or more goals in four of their last five. It won’t get any easier after the break, as they face the second-place Flames and the Bruins in their first two games. They need to turn it around quickly or they will slip outside the top 10 in the standings in the blink of an eye. The Hurricanes have been hurting for goal scoring all season and the acquisition of Nino Niederreiter has helped greatly in the short period of time he’s been with the team. In four games with Carolina, the former Wild already has four goals and the ‘Canes have scored at least five goals twice in that span. Hopefully he can carry that momentum after the break. The Dallas Stars snapped their four-game losing streak before entering the break, beating the Jets 4-2. The Super Computer bumps them up two spots, but there is still work to be done in Dallas. 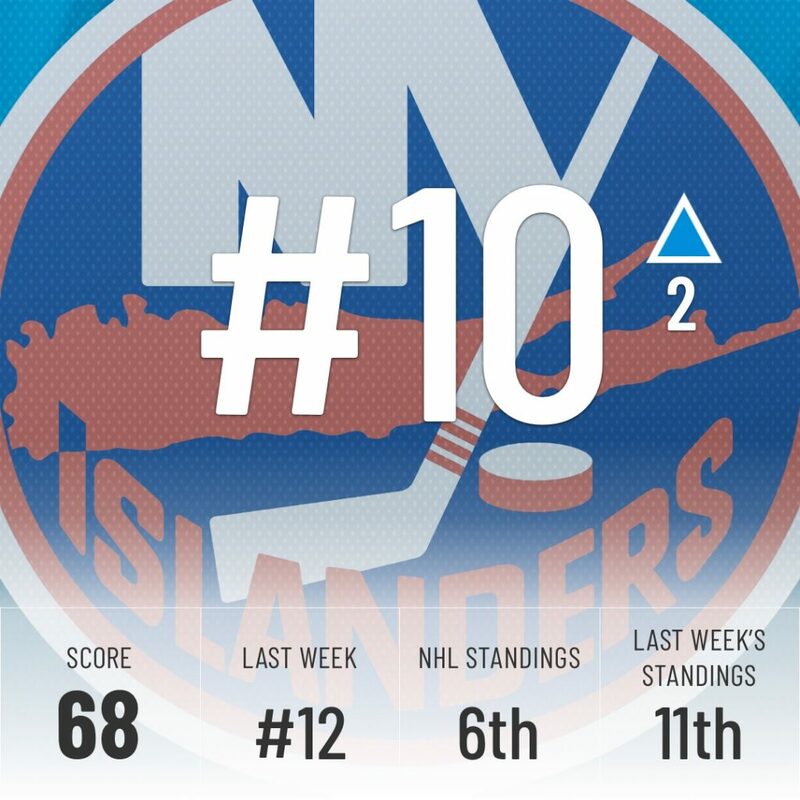 They’re currently the only team in playoff position to have a negative goal differential. They have a key, four-point game against the Wild coming up right after the All-Star break. 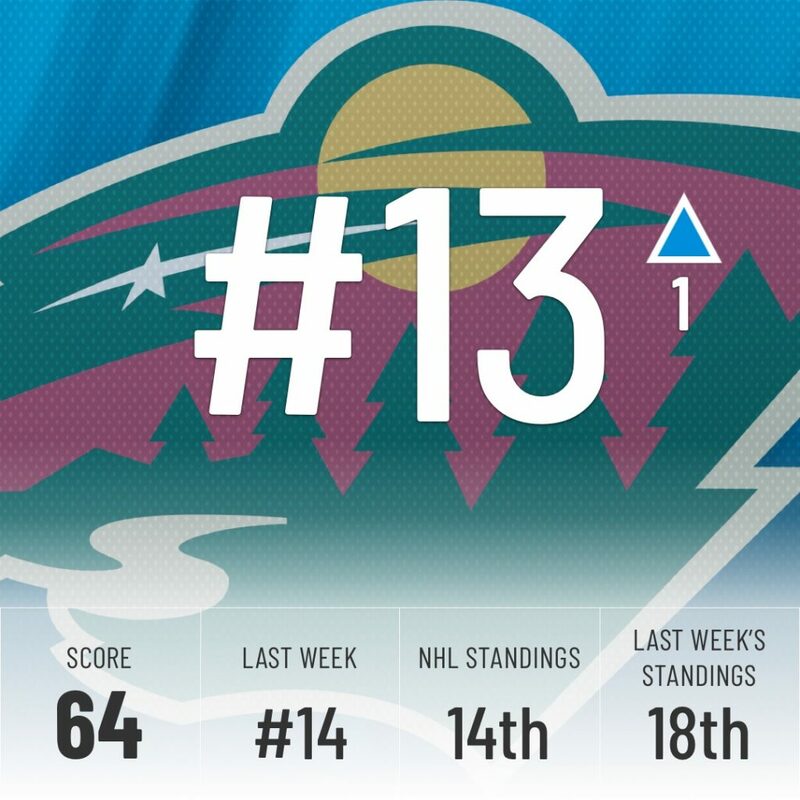 A win would put them just one point behind Minnesota for third in the Central. 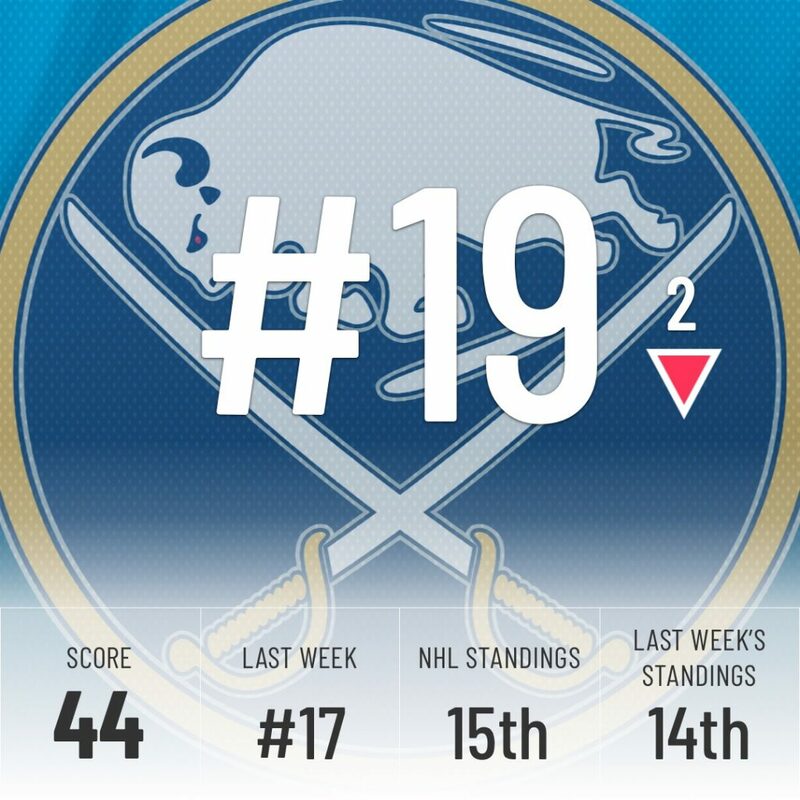 Buffalo falls down two spots but it has more to do with teams around them climbing than their performance over the last week. 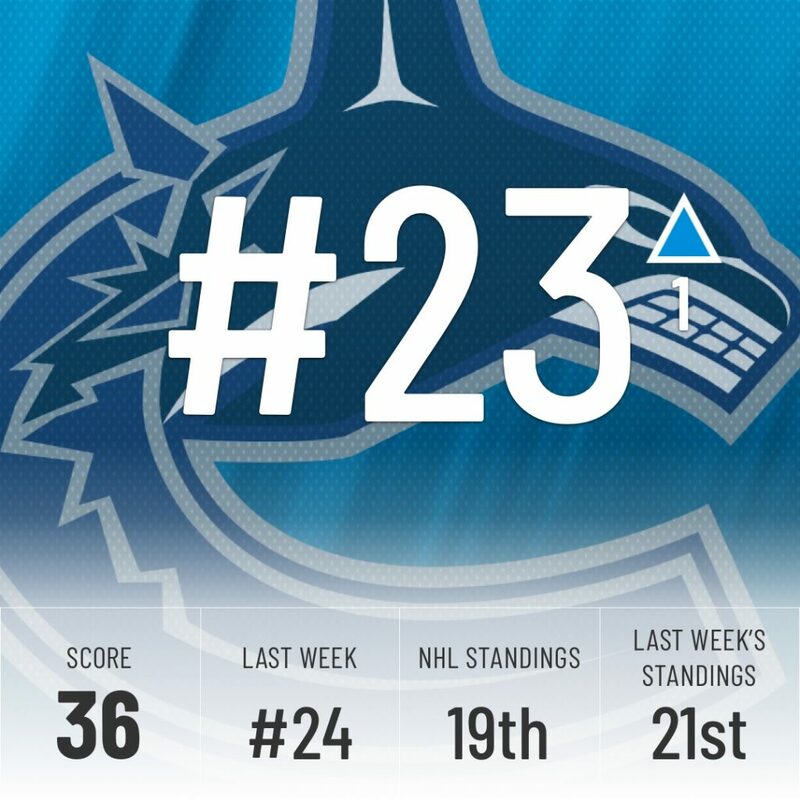 They lost their only game of the week against the Canucks by a single goal. They’ve started 2019 slowly, with only three wins in eight games. With that pace, they’ve struggled to keep up in the hunt for the last Wild Card spot. They’re by no means out of it, but a four-point deficit will grow fast if they can’t string together a few wins. 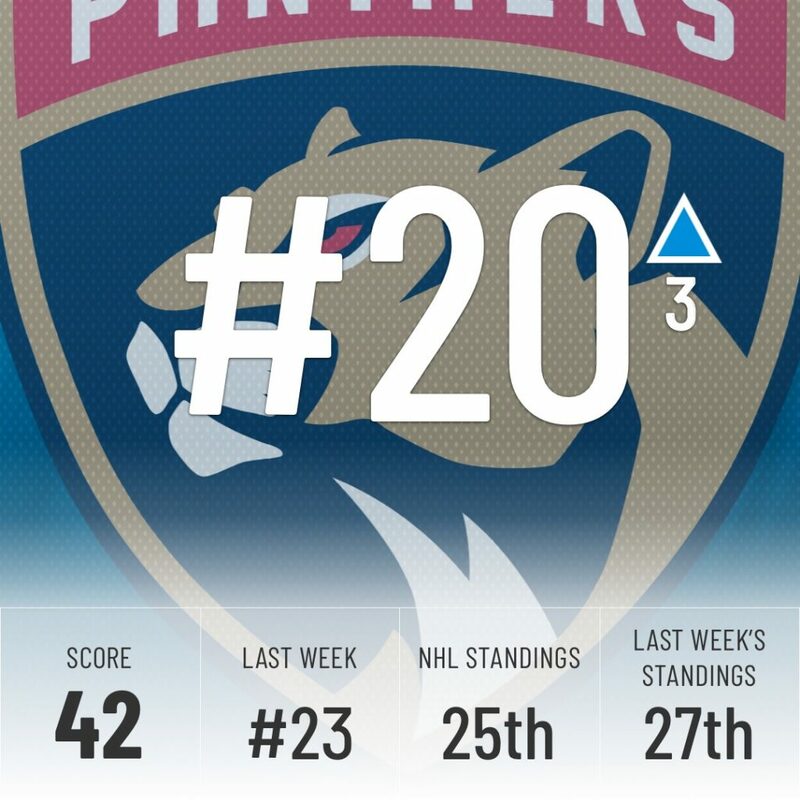 In a week where a lot of teams started their bye weeks, the Panthers are the biggest risers, jumping up three spots since last week. With wins against the Leafs, Predators, and Sharks, there’s no doubt that jump is well deserved, but they’re the only three wins the Panthers got in 2019. It doesn’t get any easier after the break, with eight of their first nine games against teams currently in a playoff spot. 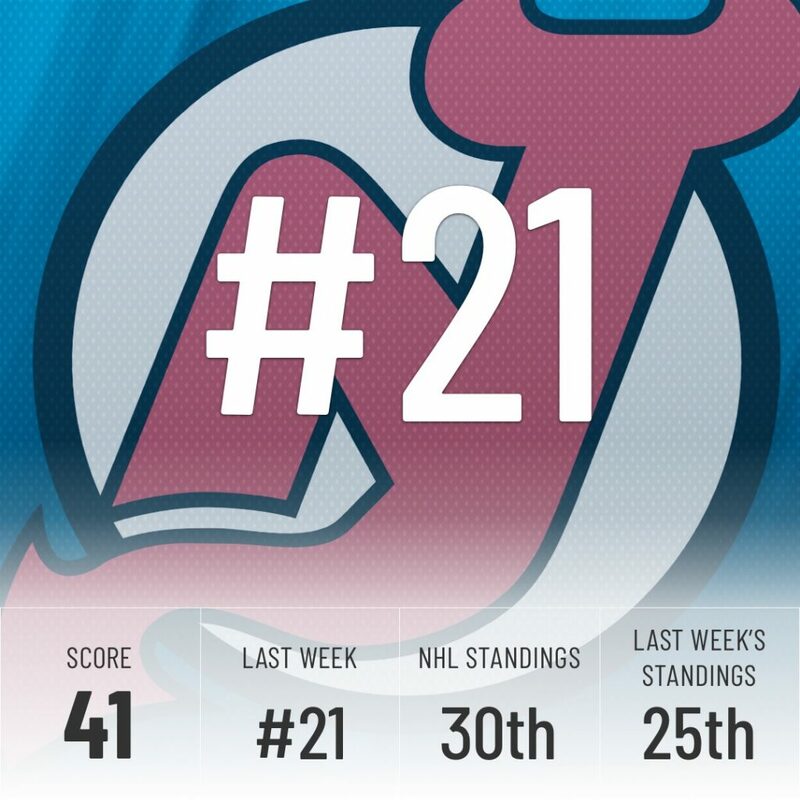 The Super Computer is a lot more optimistic on the Devils than their standings indicate. They have the best goal differential of teams in the bottom six of the standings (-24). It’s still not a very good mark, but it’s hard to properly judge this team without their heart and soul in Taylor Hall. Once he’s back, we’ll have a better read of what this team really is. 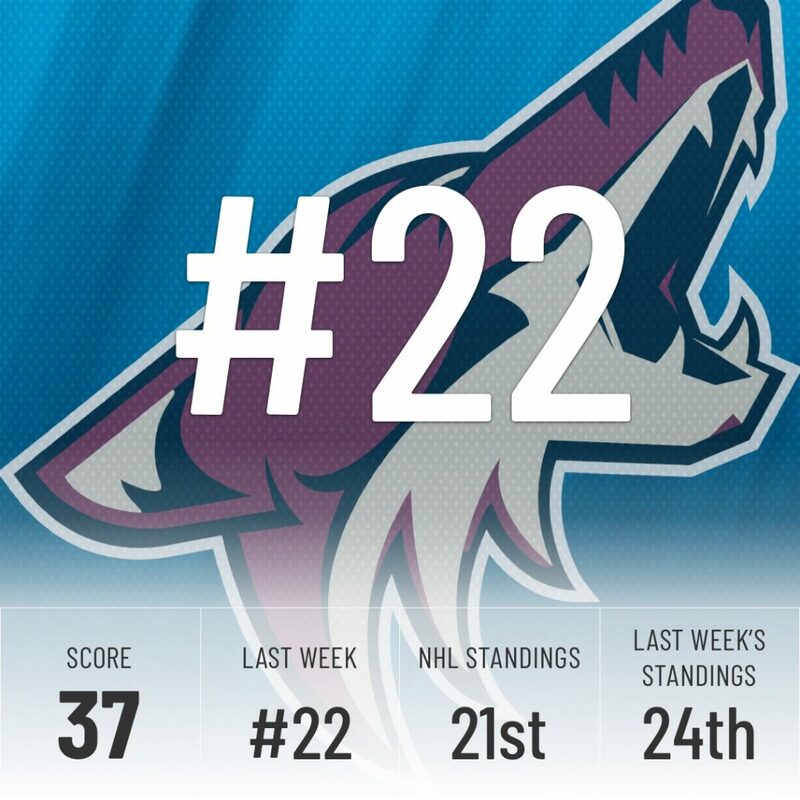 The ‘Yotes have been hit by injuries harder than any team in the NHL, but they refuse to give up. They pushed the Penguins to overtime and followed it up with wins over the Leafs and Senators, both on the road. Combine that with a 6-3 win over the Sharks and Arizona enters the break with a lot of confidence, even if they lost their last game 2-1 to the Canadiens. The firing of Peter Chiarelli put the cherry on top of a horrible week for Edmonton. They lost three straight, including a loss to the then-last place Red Wings that ultimately cost Chiarelli his job during the second intermission. Whoever becomes the next GM will have his work cut out for him. Fortunately for him, we wrote him a simple guide to relevance he’ll be able to follow to repair the Oilers. You’re welcome, unnamed future GM. 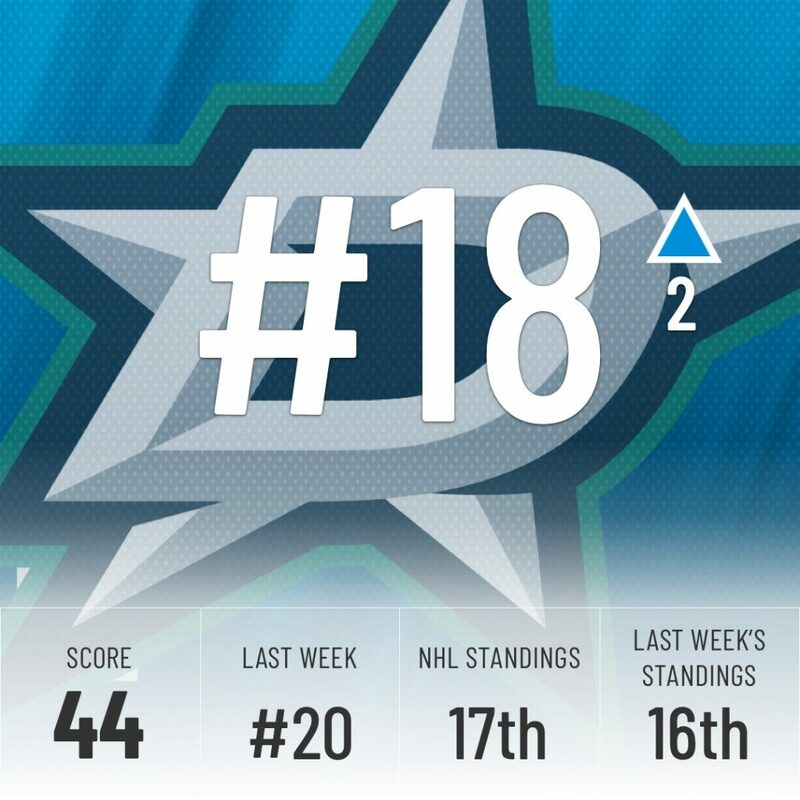 Just like Philly, the Rangers won their only game of the week, but the Super Computer believes Philly’s win was more impressive, as the two teams swapped places in the standings. Still, they enter the break on a three-game win streak, so they probably won’t mind too much. 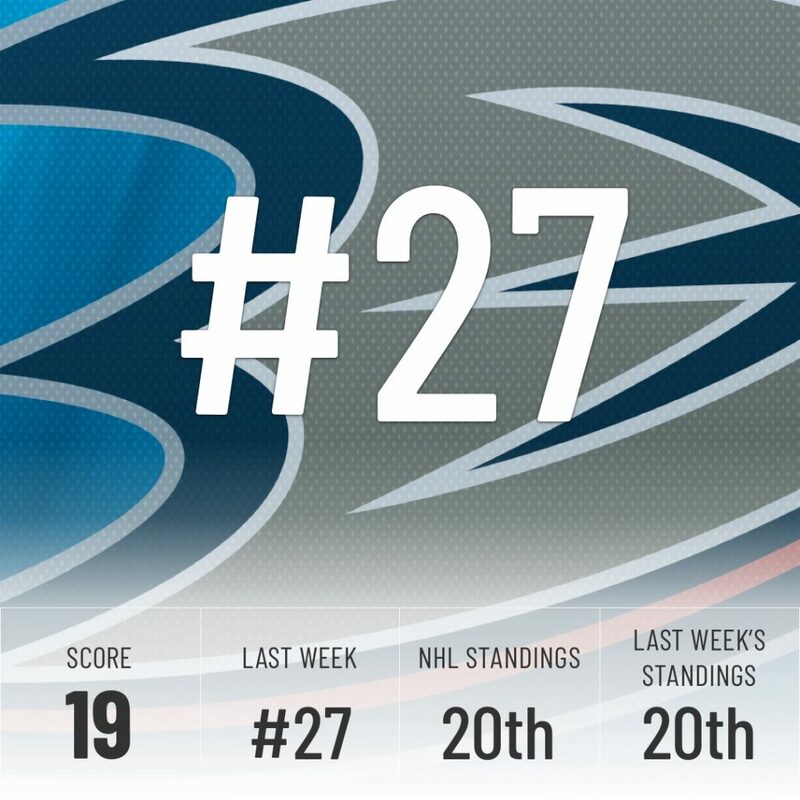 Anaheim started the week off well with a win against the Devils, but things quickly unraveled from there. They only managed to score one goal over the next two games, both losses. As if it wasn’t bad enough, they learned that Ondrej Kase, second in goals on the team, will miss the remainder of the season with a torn labrum. it’s not all doom and gloom, however. Corey Perry has started skating again and could come back before the end of the season, which would be a nice boost to their goal scoring even if he isn’t the same player he once was. 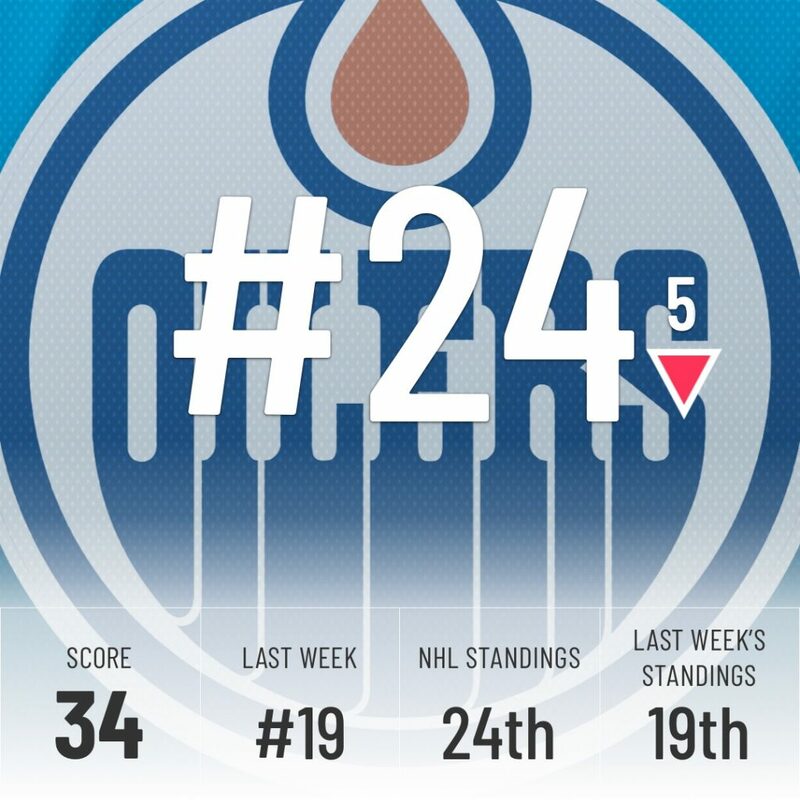 Detroit’s only win of the week came against the “playing so bad they fired their GM mid-game” Oilers. Still, kudos to them for keeping up with the Flames in a 6-4 defeat and keeping it close against the Canucks in Elias Pettersson’s return. 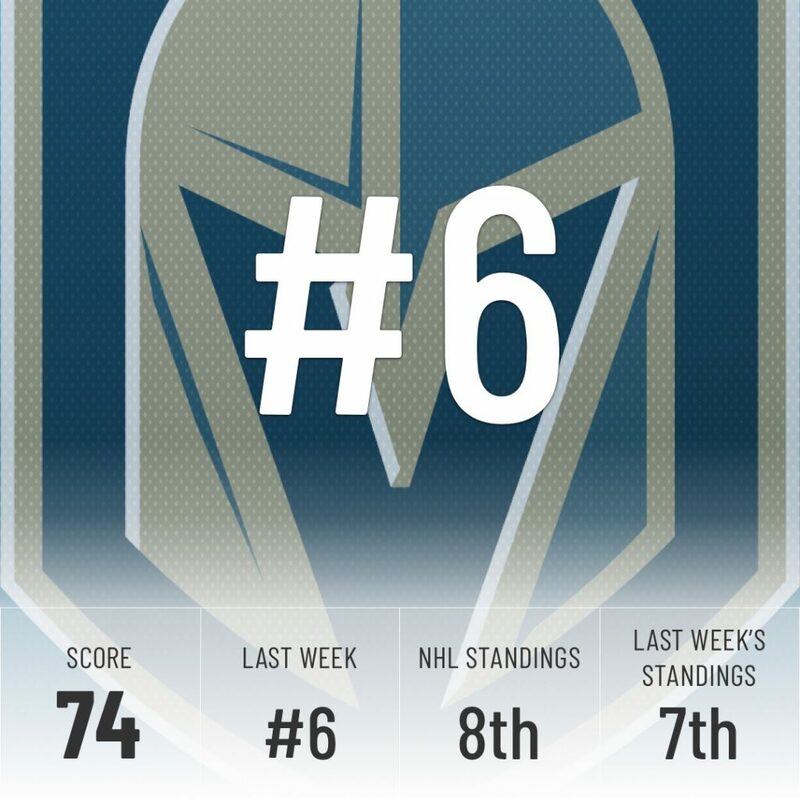 The schedule doesn’t get much more favorable, as they face the Leafs and Sens on back-to-back days, followed by the Golden Knights. 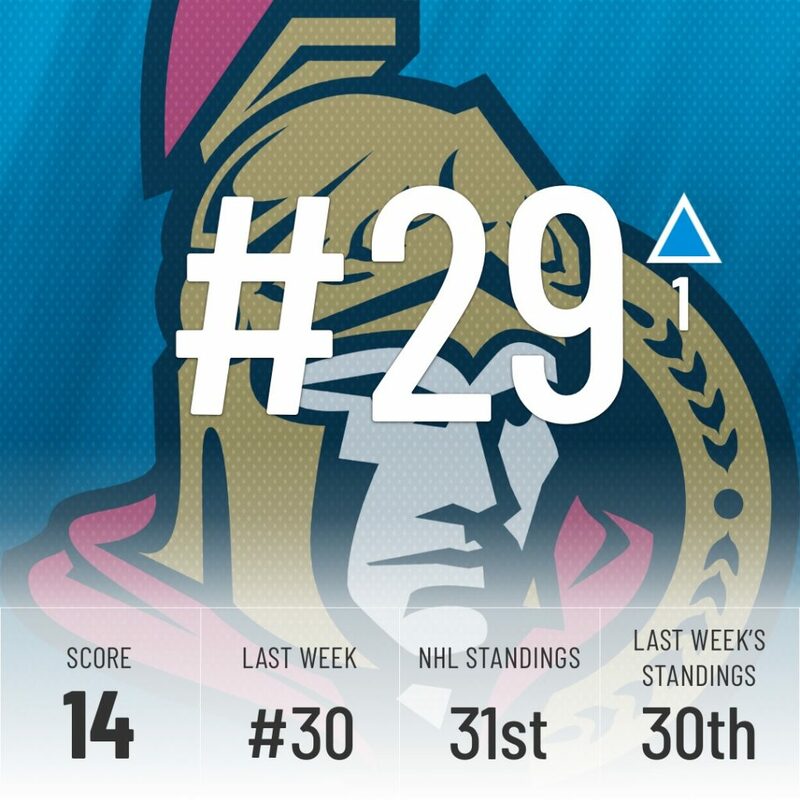 Ottawa lost twice but still escapes the week with a +1 goal differential, which pleases the Super Computer. 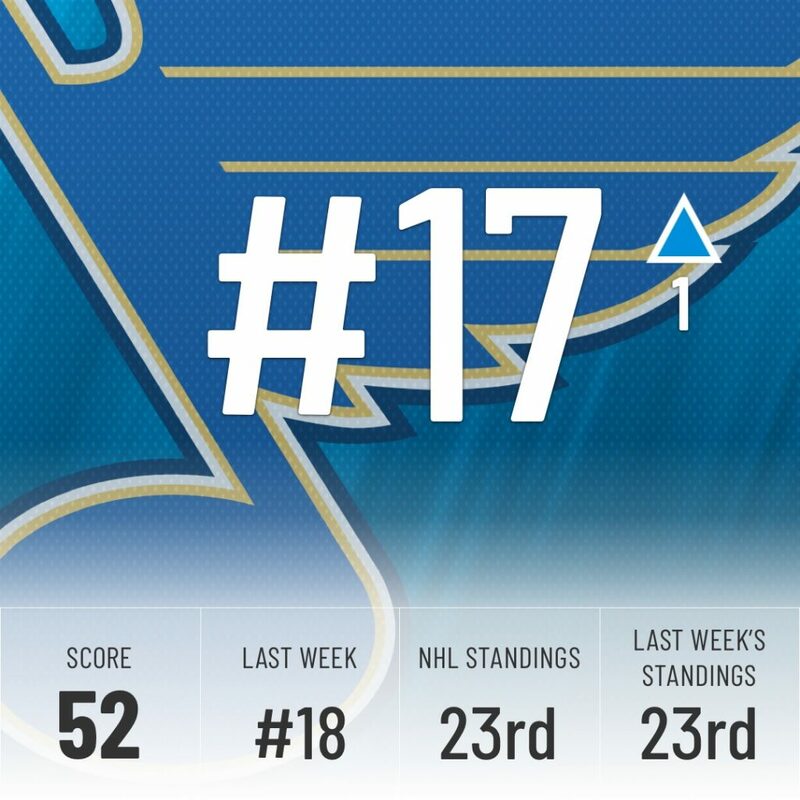 It rewards them with a one place bump up the standings even if they currently are last in the NHL. The schedule isn’t as kind, however. The Sens have a pair of back-to-backs coming out of the break. 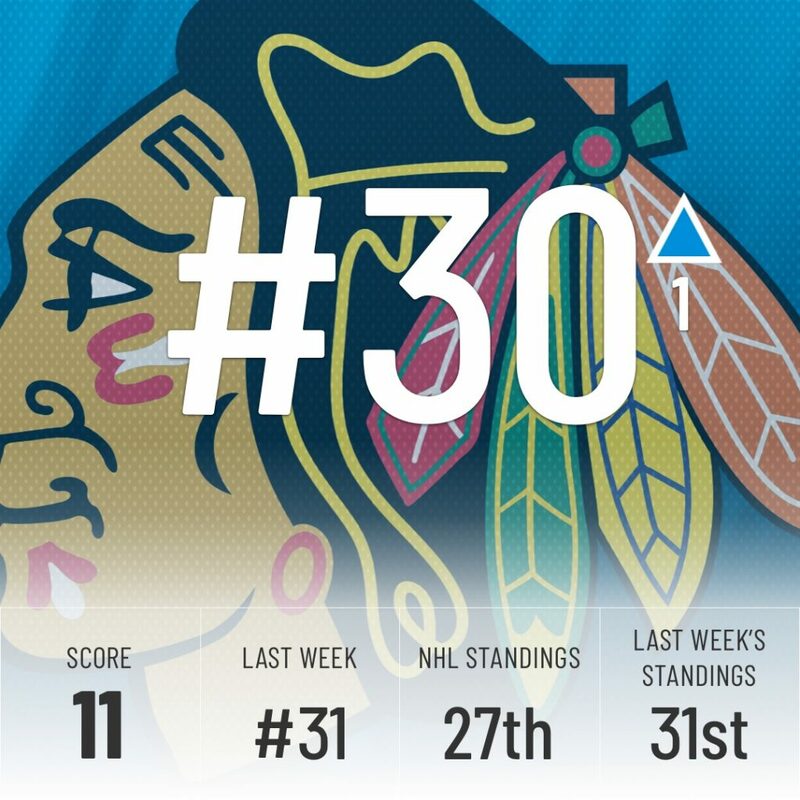 The margins are thin at the bottom of the standings, so two wins, including an eight-goal barrage against the Capitals, is more than enough to lift Chicago out of last place. 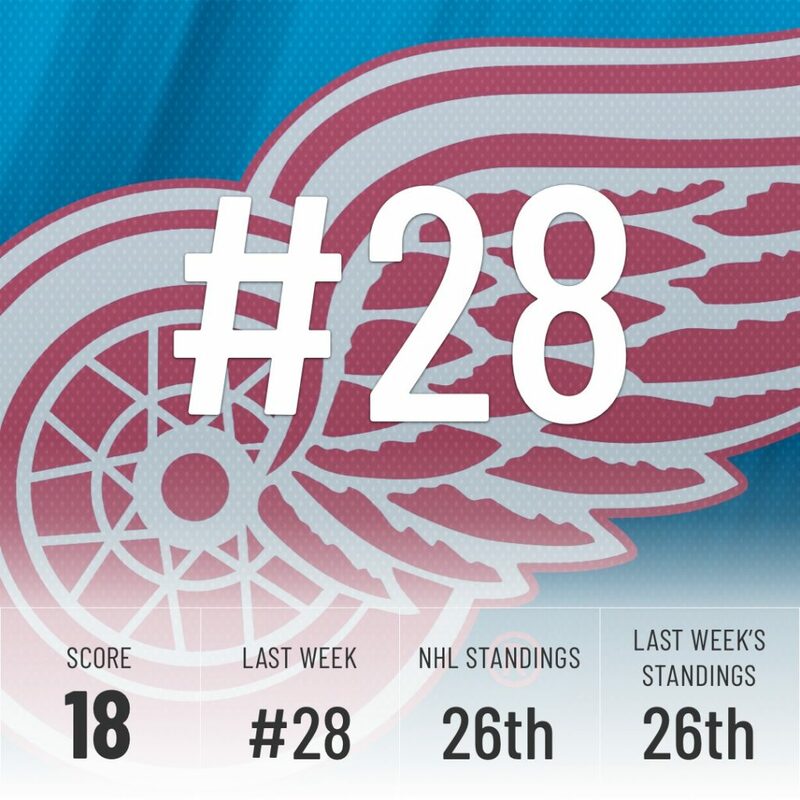 They shoot up to 27th in the NHL standings too, but with only two points separating the bottom six teams, they could jump to 26th as easily as they could fall back to last. 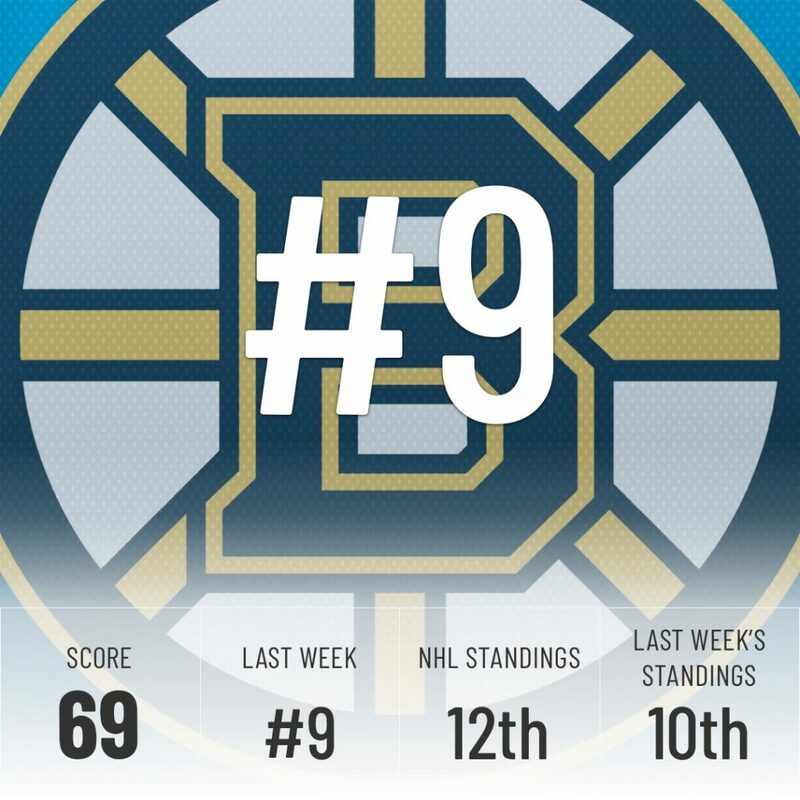 The Kings once again return to their last place throne. 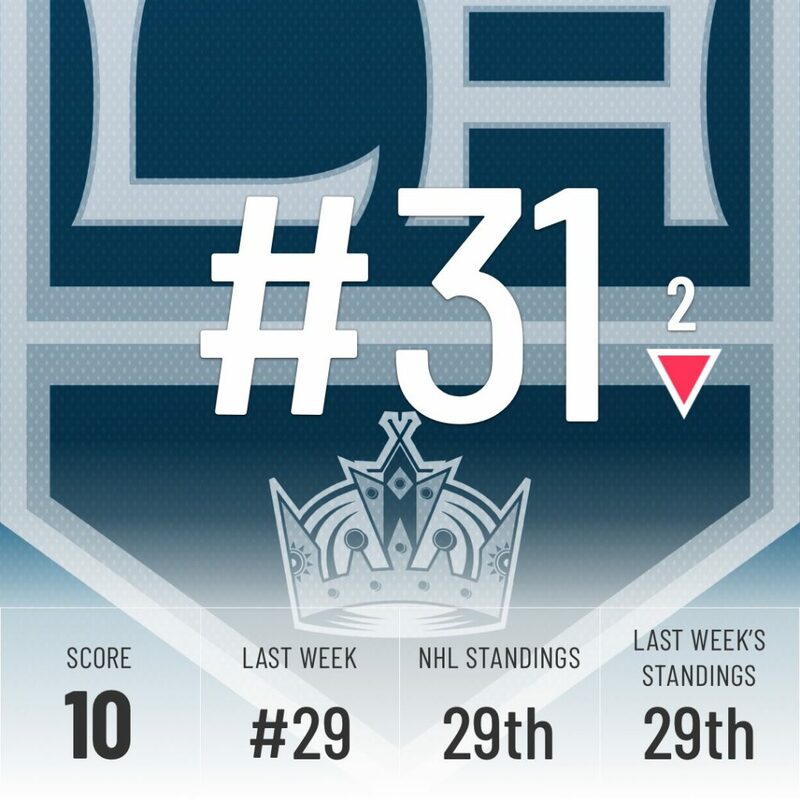 A 7-1 blowout to the hands of the Avs gave the Kings a -36 goal differential for the season, worst in the NHL. To make matters worse, they go on a six-game East Coast road trip right after the break. Bad for their record, but good for their lottery odds.